*Please direct all correspondence to our Kalamazoo headquarters. When you schedule a deposition with O’Brien & Bails, you can be assured of a pleasant atmosphere, perfect for taking a deposition. 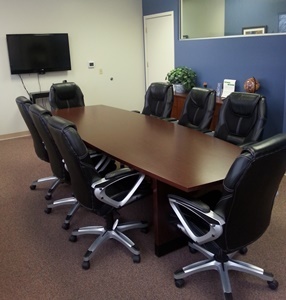 We have several conference rooms available. Whether you are expecting 4 participants or 25, our conference rooms can accommodate your needs. O’Brien & Bails court reporters are ready to provide you with full deposition amenities at our Kalamazoo location. If traveling from out of town, our deposition center is conveniently located in downtown Kalamazoo. The Kalamazoo/Battle Creek International Airport is located 10 minutes from our deposition center. For your convenience, the following restaurants are very near the deposition center. Downtown Kalamazoo is the primary shopping district for those who seek out the eclectic, charming and unique specialty retailers. Download a printable Downtown Shopping & Dining Guide to help you find what you’re looking for. Receive email updates when we publish. Happy Law Day from O’Brien & Bails!